Multiple flow rates of exhaled nitric oxide (eNO) fraction (Fe,NO) data can be modelled to estimate airway wall concentration of nitric oxide (Caw,NO), diffusing capacity of nitric oxide (Daw,NO), alveolar nitric oxide concentration (Calv,NO) and total maximal flux of nitric oxide in the airway compartment (J′aw,NO). Fe,NO at 10, 30, 50, 100 and 200 mL·s−1 from 50 chronic obstructive pulmonary disease (COPD) patients and 35 healthy controls (smokers and nonsmokers) modelled using five different methods was compared and the effect of the number of flow rates was investigated. All methods showed that current smoking reduced C&SetFont Italic="0";aw,NO in COPD patients, with some methods showing that smoking reduced J′aw,NO. Smoking did not affect Calv,NO or Daw,NO. The methods gave similar results for Caw,NO but there was variability between methods for J′aw,NO, Calv,NO and Daw,NO&SetFont Italic="0";. The median error by least squares fitting between modelled and actual data was significantly lower for the nonlinear method (1.96) compared with the mixed methods (3.31 and 3.62). Parameters calculated using the nonlinear method using five and four flow rates were significantly different. The ratio (95% confidence interval) of Caw,NO was 2.02 (1.45–2.83). Nitric oxide models give different results, although airway conductance of nitric oxide is relatively model independent. Nonlinear modelling has the least error, suggesting it is the best method. The number of flow rates should be standardised. Chronic obstructive pulmonary disease (COPD) is a progressive inflammatory condition characterised by poorly reversible airflow obstruction. The role of nitric oxide (NO) in the pathophysiology of COPD is not fully understood. NO is synthesised from l-arginine by NO synthase (NOS) enzymes 1 and can have multiple biological effects, including neurotransmission 2, vasodilation 2 and immunoregulation 3, 4. Inducible NOS expression is increased in cells within the lumen and the airway wall of patients with COPD 5–7. Increased airway concentrations of NO-related species may upregulate levels of oxidative stress and inflammation 8, with protein nitration and nitrosylation 9, 10 altering cell function. The measurement of exhaled NO fraction (Fe,NO) at a single flow rate is a widely used biomarker of airway inflammation 11–13. An alternative explanation for raised Fe,NO levels may be alveolar capillary block in emphysema, for example. The applications of this measurement in COPD have been limited, as current cigarette smoking reduces Fe,NO levels 14 by either: 1) inhibition of airway NOS activity 15; or 2) an increase in levels of oxidative stress leading to the consumption of NO 8, 10. This may explain the normal range of Fe,NO at a single flow rate, which is observed in many COPD patients 16. Nevertheless, Fe,NO is raised in ex-smoker COPD subjects 17, 18 and subjects with unstable disease 16, which is indicative of raised levels of inflammation, compared with controls, and may be used to predict drug responsiveness 18. It has been reported that this model is useful for assessing inflammation in the lung periphery, as Calv,NO is raised in patients with asthma 22 and COPD 23, 24 and does not change with inhaled corticosteroid (ICS) treatment 22, 24, 25. Furthermore, it has been reported that smoking reduces Caw,NO 26. Alterations in Daw,NO have also been described and this may be the cause of elevated Fe,NO levels in asthma regardless of the Caw,NO and Calv,NO levels 27. Several different mathematical approaches that are based on the two-compartment model have been applied to multiple flow rates Fe,NO data as follows: 1) linear analysis estimating a limited number of parameters, Calv,NO and J′aw,NO 20, or Daw,NO and J′aw,NO (and hence Caw,NO) 28; 2) nonlinear analysis allowing estimation of all parameters 28; and 3) a combination of linear analysis to calculate Calv,NO, followed by nonlinear fitting to determine the other parameters 23, 24, 29. These models all use different mathematical approaches and may therefore give different results. As far as the current authors are aware, these models have not been compared. The present study reports multiple flow rates modelling using Fe,NO data from COPD patients and controls. It was hypothesised that the different two-compartment modelling approaches may provide different results, and the primary aim of the study was to compare the models. The current authors also investigated the effect of the number of flow rates on the derived parameters from each method. In total, 50 COPD patients (23 smokers and 27 ex-smokers) diagnosed, according to current guidelines 30, with relevant symptom history (chronic cough, sputum production, dyspnoea wheeze), a significant smoking history (>10 pack-yrs) and spirometric measurements of forced expiratory volume in one second (FEV1) <80% and FEV1/forced vital capacity <0.7 participated in the study. Patients were required to be able to perform technically acceptable exhaled NO (eNO) measurements at all five flow rates used in the study. A total of 77 COPD patients were recruited for this study, but 27 patients were excluded as they were not able to perform acceptable eNO measurements at all five flow rates. Two healthy control groups (21 healthy smokers (HS) and 19 healthy nonsmokers (HNS)) with no history of respiratory disease and normal spirometry were also recruited. HS were defined based on normal lung function and a smoking history of >10 pack-yrs. The study subject demographics are shown in table 1⇓. Only subjects who had negative skin-prick tests to three allergens (house dust mite, grass pollen and cat hair; ALK Abello, Hørsholm, Denmark) were included and patients with a clinical history of asthma or atopy were excluded. Exclusion criteria were a respiratory tract infection or exacerbation of COPD in the preceding 6 weeks. Written and informed consent was obtained and the local ethics committee approved the study. Subjects abstained from food and caffeine for 2 h, smoking for 6 h and alcohol for 12 h prior to the measurement of Fe,NO using a Niox chemiluminescence online analyser (Aerocrine, Solna, Sweden). The analyser was calibrated according to the manufacturer's instructions every 14 days. After inhaling NO-free air to total lung capacity, subjects exhaled at a constant flow rate against a resistor to collect the plateau NO concentration. Readings can only be taken at five flow rates with the Niox machine as the manufacturer only provides resistors for the following five flow rates: 10, 30, 50, 100 and 200 mL·s−1. The actual flow rates achieved were required to be within 10% of the target flow rate 31. The exhalation times required were 20, 10, 10, 6 and 6 s, respectively, at these flow rates as per the manufacturer's guidelines. These standard settings ensure that the total volume of air exhaled at each flow rate accounts for the exclusion of dead space 31. The manufacturer's information about the Niox analyser states that the accuracy of the Fe,NO measurement is ±2.5 ppb of measured value <50 ppb and ±5% of measured value >50 ppb, and the linearity is <2.5 ppb integral linearity. It is possible that these parameters differ with the flow rates used; this requires further study. Three acceptable readings were recorded according to the American Thoracic Society (ATS) guidelines 31 at each of the five flow rates in one sitting. Recalibration was not required after each change of resistors. In a random subgroup of 12 COPD patients, within-day variability of eNO was assessed by comparing measurements taken at 10:00–13:00 h on the same day, and between-day variability was determined by comparing readings taken at 10:00 h 1 week apart. The mathematical techniques are as described below. VNO is plotted against flow rate at the higher flow rates and equation 4 is used to deduce that Calv,NO is the slope of the straight line where the y-intercept is (Caw,NO−Calv,NO) Daw,NO, which represents Jaw,NO, and only approximates to J′aw,NO if Calv,NO approaches zero 20. Daw,NO is estimated from the slope and Caw,NO from the x-intercept 28. Equation 2 is used to determine all parameters using the Solver tool in the program Microsoft Excel. J′aw,NO is calculated as the product of Caw,NO and Daw,NO 28. Linear method 1 is used to determine Calv,NO from equation 4. Data from a range of low-to-high flows is then applied to equation 2 to estimate Caw,NO and Daw,NO by nonlinear regression using the Solver tool in Microsoft Excel. J′aw,NO is calculated as the product of Caw,NO and Daw,NO 23. Natural log transformation was required to normalise all the model-derived data except Daw,NO, which remained nonparametric; thus, geometric means and 95% confidence intervals (CI) are presented for Calv,NO, Caw,NO, J′aw,NO and Fe,NO and median (interquartile range) for Daw,NO. ANOVA followed by unpaired t-tests with Welch correction as appropriate were used to compare parametric data between groups and assess the effect of ICS on Fe,NO and model parameters. The nonparametric Kruskal–Wallis test with the Dunn post-test followed by the Mann–Whitney U-test was applied in the case of Daw,NO. Repeated measures of ANOVA followed by the Bonferroni multiple comparisons tests were used to assess differences between the modelling methods and to evaluate the effect of using different numbers of flow rates for methods that required more than two flow rates to calculate parameters, i.e. nonlinear analysis and mixed linear and nonlinear analyses. The nonparametric Kruskal–Wallis test with the Dunn post-test followed by Wilcoxon matched pairs signed rank test was applied in the case of Daw,NO. Repeated measures of ANOVA followed by the Bonferroni multiple comparisons test were used to compare the error of modelled data to actual data using techniques that required nonlinear modelling, i.e. nonlinear analysis and mixed linear and nonlinear analyses. The model parameters were calculated by the nonlinear and mixed methods using four flow rates, by excluding data from either the lowest (10 mL·s−1) or the highest (200 mL·s−1) flow rates. Four flow rate data were compared to five flow rate data using paired t-tests or the Wilcoxon matched pairs signed rank test for Daw,NO. The nonparametric Spearman correlation was used to analyse the relationship between FEV1 and NO. Within- and between-day variability of Fe,NO and model parameters were analysed by assessing the differences between groups using paired t-tests, except in the case of Daw,NO when the Wilcoxon paired test was applied. A p-value of <0.05 was considered statistically significant. COPD smokers had significantly lower Fe,NO levels at all five flow rates compared with COPD ex-smokers. The results for Fe,NO measured at a flow rate of 50 mL·s−1 (Fe,NO,0.05) are shown in figure 1⇓. The mean (95% CI) for COPD smokers and ex-smokers were 12.1 (9.2–16.0) and 18.41 (14.1–24.1), respectively. There were no other differences between the groups at any of the other flow rates. Fe,NO levels at all flow rates in COPD patients were not influenced by ICS use. Fe,NO,0.05 was similar in ICS users (19.11 (9.4–28.9)) compared with those not taking ICS (25.0 (16.0–35.0)). 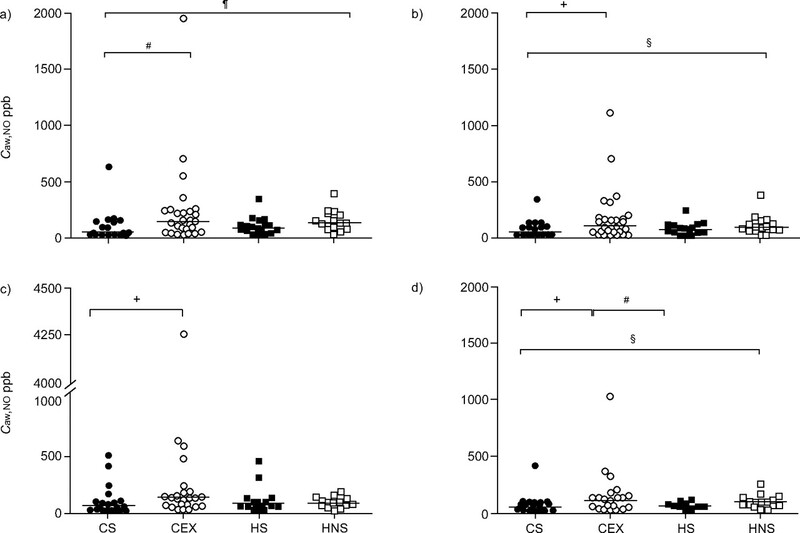 Box and whisker plots showing 25th to 75th percentile of exhaled nitric oxide fraction measured at a flow rate of 50 mL·s−1 (Fe,NO,0.05) in chronic obstructive pulmonary disease (COPD) subjects and healthy subjects. The middle line represents the median and error bars extend from the lowest to the highest values. CS: COPD smokers; CEX: COPD ex-smokers; HS: healthy smokers; HNS: healthy nonsmokers. #: p = 0.003. All the analysis methods showed Caw,NO was significantly reduced in COPD smokers compared with COPD ex-smokers (fig. 2⇓). All the methods except for mixed model 1 showed a significant reduction in COPD smokers compared with HNS, while the mixed model 2 showed a significant reduction in Caw,NO in HS compared with COPD ex-smokers. Airway wall concentration of nitric oxide (Caw,NO) in chronic obstructive pulmonary disease (COPD) and healthy subjects calculated by four different methods: a) linear, b) nonlinear, c) mixed 1 and d) mixed 2. CS: COPD smokers; CEX: COPD ex-smokers; HS: healthy smokers; HNS: healthy nonsmokers. Horizontal bars represent geometric means. #: p = 0.003; ¶: p = 0.004; +: p = 0.01; §: p = 0.02. There was evidence that cigarette smoking reduced J′aw,NO (fig. 3⇓). All the methods except mixed model 1 showed that J′aw,NO in COPD smokers and HS was reduced compared with COPD ex-smokers. Mixed model 1 showed that J′aw,NO was significantly lower in HS compared with HNS. 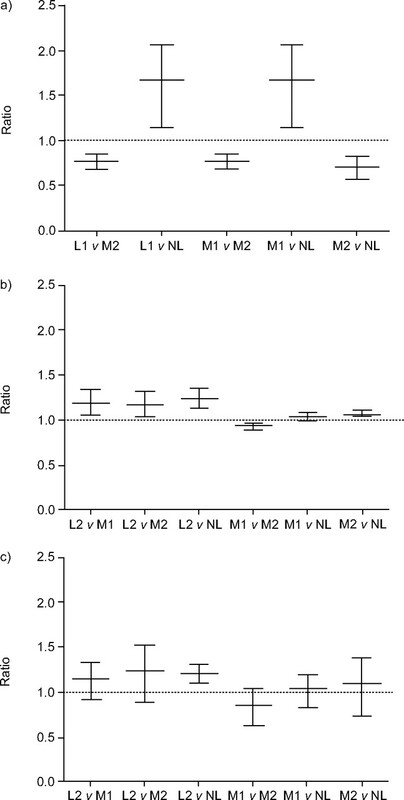 Total maximal flux of nitric oxide in the airway compartment (J′aw,NO) in chronic obstructive pulmonary disease (COPD) and healthy subjects calculated by four different methods: a) linear 2, b) nonlinear, c) mixed 1 and d) mixed 2. CS: COPD smokers; CEX: COPD ex-smokers; HS: healthy smokers; HNS: healthy nonsmokers. Horizontal bars represent geometric means. #: p = 0.02; ¶: p-0.03; +: p = 0.05; §: p = 0.04. There were no differences between groups (p>0.05 for all comparisons) in Calv,NO and Caw,NO using all of the modelling methods (tables 2⇓ and 3⇓). Model parameters calculated by all five methods were not influenced by ICS use. FEV1 was not related to: Fe,NO at all five flow rates (p>0.05 for all associations); or NO model parameters (Caw,NO, Calv,NO, Daw,NO and J′aw,NO) derived from the five modelling methods (p>0.05 for all associations) in COPD smokers or COPD ex-smokers. The data from COPD patients was used to compare the different modelling methods (fig. 4⇓). Calv,NO (fig. 4a⇓) was significantly different between all the methods used, i.e. no two methods gave the same result for this parameter. Daw,NO data was nonparametric so mean and 95% CI could not be obtained for comparisons between methods. Nonparametric (Wilcoxon matched pair test) comparisons showed significant differences between all the methods (p<0.05 for all comparisons). J′aw,NO (fig. 4b⇓) was also different for the majority of between-method comparisons, while there was more agreement between methods for the measurement of Caw,NO (fig. 4c⇓), as the majority of methods gave similar results. Similar results for comparisons between methods were obtained when using data from COPD patients and healthy subjects combined (data not shown). Differences in a) alveolar nitric oxide (NO) concentration, b) total maximal flux of NO in the airway compartment and c) airway conductance of NO between the NO modelling methods in chronic obstructive pulmonary disease. L1: linear 1; L2: linear 2; M1: mixed 1; M2: mixed 2; NL: nonlinear; v: versus. The middle horizontal bar represents the ratio of the two groups and the upper and lower bars represent the 95% confidence interval of the ratio. The error between modelled and actual data using the least squares fitting technique for nonlinear regression was significantly lower for the nonlinear method compared with the mixed methods, which involved linear analysis prior to nonlinear regression (fig. 5⇓). The mixed methods produced a similar degree of error. Error between modelled data and actual data derived for nitric oxide model parameters; comparison of the mixed and full nonlinear methods. M1: mixed model 1; M2: mixed model 2; NL: nonlinear method. Horizontal bars represent geometric means. #: p<0.0001. With nonlinear analysis, all the parameters calculated using five flow rates were significantly different to those from the four highest or lowest flow rates (table 4⇓). The significant differences between groups in Caw,NO and J′aw,NO observed with five flow rates (figs 2⇑ and 3⇑) were no longer present when only four flow rates were used. Significant differences observed in Caw,NO between groups, using five flow rate data, became insignificant when only four flow rate data was applied (data not shown). For mixed model 1, all the parameters were altered by the number of flow rates applied, except for J′aw,NO which was similar when calculated from the five and four highest rather than the four lowest flow rates. The number of flow rates used did not alter any parameters, with the exception of Calv,NO when calculated using mixed model 2. The FeNO readings at all five flow rates were similar when repeated on the same day or 1 week later (table 5⇓). There was no significant within- or between-day difference (p>0.05 for all comparisons) for any of the flow rates, indicating satisfactory reproducibility. As would be expected, there was also no significant within- or between-day variability (p>0.05 for all comparisons) for the model-derived parameters calculated from this data by all five methods (data not shown). The present study set out to compare data from two-compartment NO models in COPD. The main findings were as follows. 1) The nonlinear model 28 had the least error; therefore, the current authors propose that this model should be adopted in future COPD studies, though using more than one modelling technique would be a sensible way to ensure the validity of results. 2) Calv,NO data appeared to be highly variable, challenging current opinion regarding the potential applications of Calv,NO measurements in COPD 24, 32. 3) Data from five flow rates were more reliable than data from four flow rates. These findings need to be taken into account when comparing studies using different models and also for future recommendations for guidelines on use of multiple flow NO modelling. The degree of agreement between the different mathematical models was assessed, and a high degree of agreement for Caw,NO was found but much less was found for all other parameters. In particular, Calv,NO results were extremely model-dependent. There is no “gold standard” modelling method, so it is not known which mathematical model actually provides the most clinically meaningful data. For the three mathematical methods that estimate all the model parameters (i.e. those that use nonlinear modelling), the current authors observed that mixed linear and nonlinear modelling methods result in more errors compared with pure nonlinear modelling. Given the differences between the various models, the method with the best fit to the actual data (i.e. pure nonlinear modelling) may be regarded as providing the most accurate results. For mixed modelling methods, nonlinear fitting of data (for Daw,NO and Caw,NO or Daw,NO and J′aw,NO) is constrained by the assumption already made for Calv,NO by the initial linear part of the method. The increased error of mixed methods (compared with pure nonlinear modelling) can be explained by the degree of inaccuracy associated with initially estimating Calv,NO, which is then added to the error derived by nonlinear fitting based on this value of Calv,NO. For linear models only two out of the three model parameters were predicted and the actual data coincides exactly with the modelled data at the two flow rates used; hence, the error could not be assessed. The present study was confined to COPD but similar studies should be performed in other disease states to validate specific modelling methods. The advantage of nonlinear and mixed modelling is that more parameters can be estimated compared with linear modelling. A practical drawback is that a greater number of flows are required, including those at the lower range, which can be technically challenging for some subjects. In the current study, only 50 out of 77 patients were able to perform readings at all five flow rates, as they were unable to perform reliable readings at the lower flow rates (10 and/or 30 mL·s−1). These readings are necessary for modelling methods in order to accurately estimate Caw,NO and Daw,NO. The number of flow rates that should be used for multiple-flow rate modelling has not been standardised. There is some published evidence from a small sample set that nonlinear modelling is dependent on the number of flow rates used 23. For the methods that require data from more than two flow rates to perform modelling, the effect of using data from different numbers of flow rates was assessed. The nonlinear method and mixed model 1 showed flow-rate dependency, as results from four and five flow rates were significantly different, and these methods were most sensitive using five flow rates, i.e. significant Caw,NO findings using five flow rates became nonsignificant with four flow rates. In contrast, mixed model 2 was relatively flow-rate independent. This has practical implications for the use of the linear method and mixed model 1, as the number of flow rates used should be standardised, with the current data showing that five flow rates are needed. The flow rates used in the current study were limited by the commercially available resistors. Previous studies have used flow rates >200 mL·s−1 to improve the reliability of the calculated parameters 23, 26. The current study proves that NO modelling results are dependent on the number of flow rates used, and it is likely that the use of additional flow rates >200 mL·s−1 will also influence the modelled parameters. The Fe,NO,0.05 data showing lower levels in COPD smokers compared with COPD ex-smokers is in agreement with previous published data 16, 17. Two-compartment NO modelling showed that this difference was due to a decreased Caw,NO, regardless of which model was applied. There was also evidence that smoking reduced Caw,NO and J′aw,NO in HS, although the exact pattern of differences between the four groups for both Caw,NO and J′aw,NO varied with the models used. In contrast, smoking did not affect Calv,NO and Daw,NO. The current findings of a reduction in NO production in the airway wall of smokers, rather than the alveolar region, is in agreement with previous data 23, 26. It has been reported that Calv,NO is increased in COPD patients 23, 24 and is related to disease severity but is not influenced by current smoking 24. The present COPD patients did not have severe disease, so the current authors were less able to evaluate whether Calv,NO was related to disease severity. However, the present data show that Calv,NO is an extremely model-dependent parameter and, therefore, Calv,NO results obtained from one model may be less robust than Caw,NO results that are less model-dependent. Furthermore, the modelling method used by Brindicci et al. 24 apparently uses the linear method 1 to estimate J′aw,NO, whereas this method actually estimates (Caw,NO−Calv,NO) Daw,NO, which is J′aw,NO. This subtle but important change to the accepted method probably alters subsequent nonlinear calculations. Given the evidence from the current study that smoking reduces airway wall NO production, it is interesting to speculate on the mechanisms involved. The inhibition of NOS activity in the airway wall epithelium 15 is a possibility. Airway arginases and the metabolism of asymmetric dimethyl arginine, superoxides 8 and nitrosoglutathione 9, 10 may also be affected by smoking by upregulation of NO metabolites. Alternative nitration pathways are also proposed, whereby nitrites are oxidised by myeloperoxidase or xanthine oxidase 10. In smokers with COPD, the level of airway wall NO may be further complicated by the effects of airway pH and bacterial airway colonisation on nitrogen oxides 33; reduced airway pH aids in the conversion of nitrite to NO. An important methodological point to raise is that the actual Fe,NO reading that is accepted from the exhalation trace is dependent on whether the peak or plateau is used. This is particularly important at higher flow rates, as these are essential for accurate estimation of Calv,NO. However, the procedure used in clinical practice is variable, depending on the NO analyser set up and operator preference, and in the future it would be preferable to have some standardisation of this procedure. Additionally, ATS guidelines recommend that the mean of three NO plateau measurements that are within 10% are taken for a Fe,NO reading 31. However, this may not be practically feasible for some patients if the absolute readings are low, as seen at the higher flow rates. The advantages of NO modelling over single flow rate data is that the location of altered Fe,NO production can be identified. The current authors, in agreement with others, have shown that Calv,NO 24, 32 and Daw,NO 24, 26 are unaffected by smoking, and so may have potential for assessing inflammation in COPD. In particular, Calv,NO has been proposed as a measurement that could be indicative of small airway inflammation 24, 32. However, the current data concerning the variation in Calv,NO data between models underscores the need for method harmonisation so that results from different studies can be compared. There is also the possibility that NO modelling may be a more sensitive way of detecting early signs of a COPD exacerbation 32. Furthermore, as inflammation is heterogeneously distributed in the COPD lung, NO modelling could be used for more accurate location of inflammation 32, enabling more specific targeting of treatments. These potential applications of NO modelling techniques in the future will rely on well-validated and robust methodology, which the current study out to address. Axial diffusion is important in accurately evaluating NO transport in the airways, and a three-compartment NO model has been used to include this variable 34. The present study set focused on comparisons of two-compartment models, but it would certainly be of interest for future work to similarly evaluate the three-compartment model in COPD. This study can be used to make suggestions for standardising NO multiple flow rate modelling as follows. 1) In the absence of a gold standard NO modelling method, it is recommend that future studies use more than one method to ensure the validity of the results. This would appear to be particularly important for Calv,NO. If estimation of all modelling parameters is needed (Caw,NO, J′aw,NO, Calv,NO and Daw,NO), then the present results indicate that the nonlinear method has the least error, with the greatest fit to the actual data. 2) It appears that data from more flow rates is likely to be more accurate, and certainly for the nonlinear and mixed model 1 it seems that five flow rates are needed. At present, NO modelling is more useful for research studies rather than clinical practice. The current authors hope that the recommendations made in the present study for the harmonisation of nitric oxide modelling methods will increase the value of this technique in airway inflammation research, enabling data from different investigators to be directly compared. Ricciardolo FLM, Sterk PJ, Gaston B, Folkerts G. Nitric oxide in health and disease of the respiratory system. Physiol Rev 2004;84:731–765. Ricciardolo FLM. Multiple roles of nitric oxide in the airways. Thorax 2003;58:175–182. Coleman JW. Nitric oxide in immunity and inflammation. Int Immunopharmacol 2001;1:1397–1406. Guzik TJ, Korbut R, Adamek-Guzik T. Nitric oxide and superoxide in inflammation and immune regulation. J Physiol Pharmacol 2003;54:469–487. Maestrelli P, Paska C, Saetta M, et al. 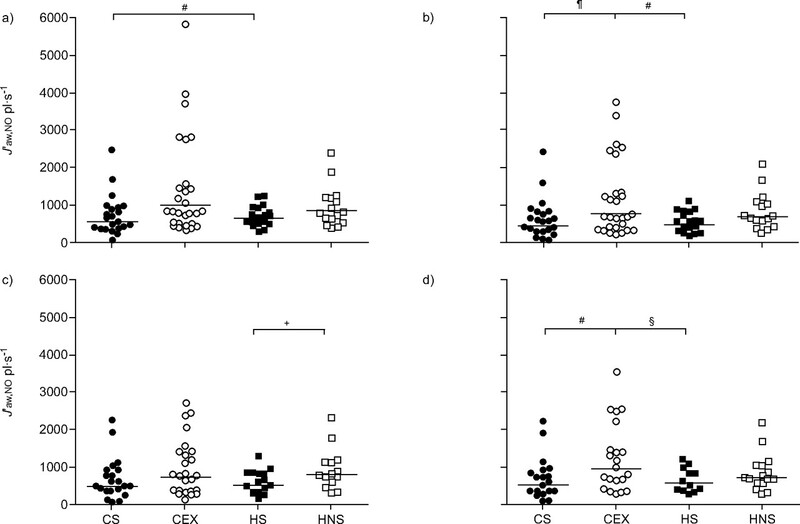 Decreased haem oxygenase-1 and increased inducible nitric oxide synthase in the lung of severe COPD patients. Eur Respir J 2003;21:971–976. Ichinose M, Sugiura H, Yamagata S, Koarai A, Shirato K. Increase in reactive nitrogen species production in chronic obstructive pulmonary disease airways. Am J Respir Crit Care Med 2000;162:701–706. Ricciardolo FLM, Caramori G, Ito K, et al. Nitrosative stress in the bronchial mucosa of severe chronic obstructive pulmonary disease. J Allergy Clin Immunol 2005;116:1028–1035. Ricciardolo FLM, Stefano A, Sabatini F, Folkerts G. Reactive nitrogen species in the respiratory tract. Eur J Pharmacol 2006;533:240–252. Grisham MB, Heuil DJ, Wink DA. Physiological chemistry of nitric oxide and its metabolites: implications in inflammation. Am J Physiol 1999;276:G315–G321. Van der Vliet A, Eiserich JP, Shigenaga MK, Cross CE. Reactive nitrogen species and tyrosine nitration in the respiratory tract. Am J Respir Crit Care Med 1999;160:1–9. Jatakanon A, Lim S, Kharitonov SA, Chung KF, Barnes PJ. 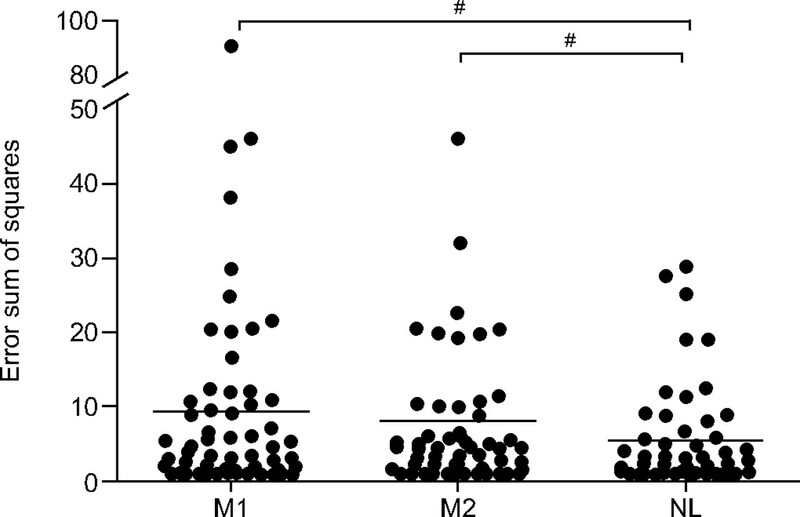 Correlation between exhaled nitric oxide, sputum eosinophils and methacholine responsiveness in patients with mild asthma. Thorax 1998;53:91–95. Kharitonov SA, Donnelly LE, Montuschi P, Corradi M, Collins JV, Barnes PJ. Dose dependent onset and cessation of action of inhaled budesonide on exhaled nitric oxide and symptoms in mild asthma. Thorax 2002;57:889–896. Ferreira IM, Hazari MS, Gutierrez C, Zamel N, Chapman KR. Exhaled nitric oxide and hydrogen peroxide in patients with chronic obstructive pulmonary disease: effects of inhaled beclomethasone. Am J Respir Crit Care Med 2001;164:1012–1015. Kharitonov SA, Robbins RA, Yates D, Keatings V, Barnes PJ. Acute and chronic effects of cigarette smoking on exhaled nitric oxide. Am J Respir Crit Care Med 1995;152:609–612. Hoyt JC, Robbins RA, Habib M, et al. Cigarette smoke decreases inducible nitric oxide synthase in lung epithelial cells. Exp Lung Res 2003;29:17–28. Maziak W, Loukides S, Culpitt S, et al. Exhaled nitric oxide in chronic obstructive pulmonary disease. Am J Respir Crit Care Med 1998;157:998–1002. Corradi M, Majori M, Cacciani CG, Consigli GF, de' Munari E, Pesci A. 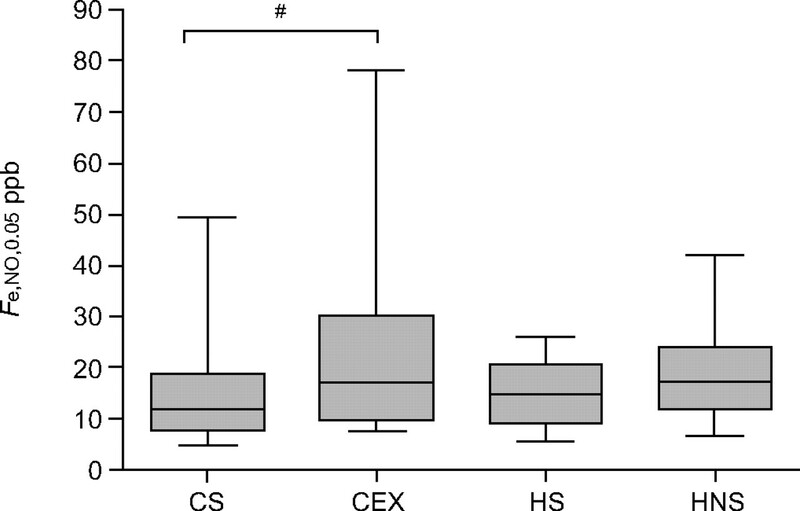 Increased exhaled nitric oxide in patients with stable chronic obstructive pulmonary disease. Thorax 1999;54:572–575. George SC, Hogman M, Permutt S, Silkoff PE. Modelling pulmonary nitric oxide exchange. J Appl Physiol 2004;96:831–839. Tsoukias NM, George SC. A two-compartment model of pulmonary nitric oxide exchange dynamics. J Appl Physiol 1998;85:653–666. Jorres RA. Modelling the production of nitric oxide within human airways. Eur Respir J 2000;16:555–560. Berry M, Hargadon B, Morgan A, et al. Alveolar nitric oxide in adults with asthma: evidence of distal lung inflammation in refractory asthma. Eur Respir J 2005;25:986–991. Hogman M, Holmkvist T, Wegener T, et al. Extended NO analysis applied to patients with COPD, allergic asthma and allergic rhinitis. Resp Med 2002;96:24–30. Brindicci C, Ito K, Resta O, Pride NB, Barnes PJ, Kharitonov SA. Exhaled nitric oxide from lung periphery is increased in COPD. Eur Respir J 2005;26:52–59. Lehtimaki L, Kankaanranta H, Saarelainen S, Turjanmaa V, Moilanen E. Inhaled fluticasone reduces bronchial but not alveolar nitric oxide output in asthma. Eur Respir J 2001;18:635–639. Malinovschi A, Janson C, Holmkvist T, Norback D. Merilainen, Hogamn M.. Effect of smoking on exhaled nitric oxide. Eur Respir J 2006;28:339–345. Shin H W, Rose-Gottron CM, Cooper DM, Newcomb RL, George SC. Airway diffusing capacity of nitric oxide and steroid therapy in asthma. J Appl Physiol 2004;96:65–75. Pietropaoli AP, Perillo IB, Torres A, et al. Simultaneous measurement of nitric oxide production by conducting and alveolar airways of humans. J Appl Physiol 1999;87:1532–1542. National collaborating centre for chronic conditions. Chronic obstructive pulmonary disease. National clinical guideline on management of COPD in adults in primary and secondary care. Thorax 2004;59: Suppl. 1 1–232. American Thoracic Society. Recommendations for standardised procedures for the offline and online measurement of exhaled lower respiratory nitric oxide and nasal nitric oxide in adults and children. Am J Respir Crit Care Med 2005;160:2104–2117. Kharitonov SA, Barnes PJ. Exhaled biomarkers. Chest 2006;130:1541–1546. Weitzberg E, Lundburg JON. Nonenzymatic nitric oxide production in humans. Nitric Oxide 1998;2:1–7. Shin HW, Condorelli P, George SC. Examining axial diffusion of nitric oxide in the lungs using heliox and breath hold. J Appl Physiol 2006;100:623–630.